Whilst we are swealtering through another heatwave here in Melbourne, I thought it a good idea to present you with some pattern ideas for the cooler months. If you’re like me, you usually leave your crafting plans until your fingers are too cold to knit or crochet! All of my gloves/mittens etc have either be eaten by the dog, or found a new home: time to make some more! So here is a free knitting pattern for Zimtstern fingerless mitts, and a crochet blanket ‘pattern’ to use up any yarn left-overs. 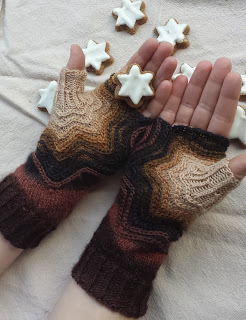 The Zimtstern Mitts caught me eye because of their unusual construction, and the pretty star shapes. Starting at the thumb, you knit increase until you hit the finger edge, then knit across the hand, and finally down the arm. The star shapes are added as you go, using a crochet hook. All of this is done with a single length of yarn, so minimal ends to darn in (yay!). These mitts would work best in a variegated yarn with short colour runs (think Noro), or perhaps try one colour for the knitting and a contrast colour for the crochet trim? Note: Do not click the PDF download on the pattern page; apparently it is spam/phishing. Isn’t this blanket amazing? What better way to brighten a winter’s night (or day) than a warm blanket created from scrap yarn. This is a tutorial rather than a pattern: basically grab three different yarns, a huge crochet hook (around 15mm), choose your favourite stitch pattern, and get hooking. The gradual colour change is achieved because not all skeins will run out at the same time, and you can join in a new skein at any time. Finally I can use up all of my scraps, regardless of their length!